At Bike Science we’re dedicated to building you the best possible bike to suit your requirements. So, even if one of Planet-X or On-One’s incredible complete bike offers don’t quite hit the mark, we’ll custom build you a machine to suit your riding style, component preferences and most importantly fit. So whether you’re after an uber high-spec dream machine, or a custom spec bike using a collection of your own existing components we can help. 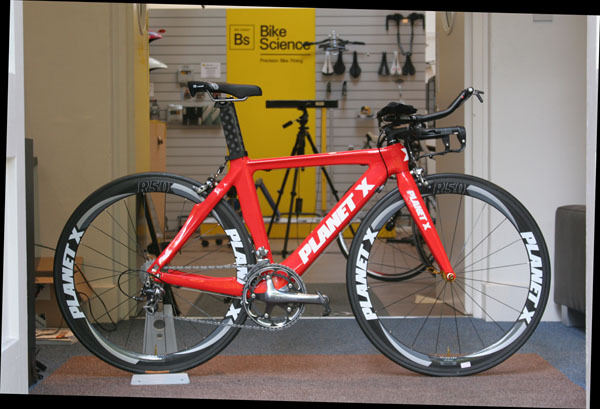 Buy any Planet X or On-One bike from Bike Science and take advantage of our HALF PRICE RETUL FIT OFFER. Combine the best value high performance bikes with the most accurate bike fitting technology available. This entry was posted on Tuesday, November 2nd, 2010 at 3:26 pm	and is filed under All Posts, Bike Fitting, Planet X Bikes, Products. You can follow any responses to this entry through the RSS 2.0 feed. Both comments and pings are currently closed.